This is an all-meat, no-bean chili that is a snap to fix and cook in a crock pot. The fact that the recipe is a simple, no-frills combination lends it to all kinds of possible variations. Add some chopped onions and bell pepper to the skillet along with ground beef, or add some chile peppers or extra cayenne. The stewed tomatoes add texture and flavor, but crushed tomatoes, fire-roasted, or chili-seasoned tomatoes would be excellent choices as well. See the variations section below the recipe for some serving and garnishing ideas and suggestions for additional ingredients. In a large skillet over medium heat, brown the ground beef, stirring to break it up. When the meat is no longer pink, drain it and spoon it into the slow cooker. Add the tomato sauce, tomato paste, stewed tomatoes (if using), and the chili powder. Mix well and add 1 teaspoon of salt and 1/2 teaspoon of freshly ground black pepper. Add hot sauce, such as Texas Pete's or Tabasco, if desired. Cover and cook on low for 6 to 8 hours or on high for 3 1/2 to 4 hours. Use regular ground beef or a coarser grind. Stewing beef or chuck is excellent in chili. Dice it or mince it in the food processor. A combination of ground beef with ground pork or sausage is delicious as well. Make your own homemade chili powder. Combine 2 teaspoons of garlic powder, 2 teaspoons of ground cumin, 2 teaspoons of sweet paprika, and 1 teaspoon each of cayenne pepper and dried leaf oregano (reduce the cayenne if you prefer a mild chili). 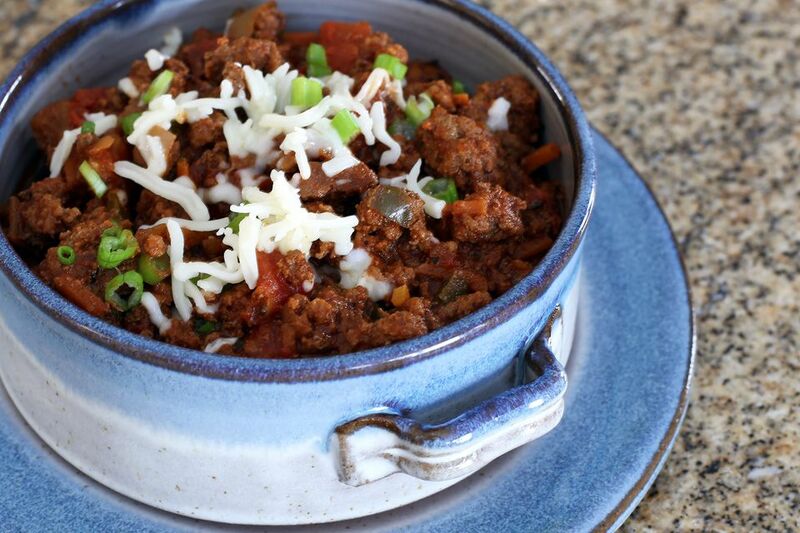 Serve the chili with a garnish of shredded mozzarella, cheddar or a Mexican-style cheese. If you like beans in your chili, feel free to add a can of drained pinto beans, black beans, or kidney beans about an hour before the chili is done. Add 1 cup of chopped onions and 1/4 to 1/2 cup of chopped bell pepper to the skillet with the ground beef. Add 1 or 2 minced cloves of garlic if you'd like. For a little extra flavor and natural sweetness, add 1 carrot, either finely chopped, shredded, or julienned. If you like heat from chile peppers, add a few tablespoons of minced jalapeno peppers to the crock pot. Or, for chile pepper flavor with less heat, add a 4-ounce can of mild chopped green chile. Garnish with thinly sliced green onions, crumbled cornbread, oyster crackers, chopped fresh onions, guacamole, chopped cilantro, or diced fresh tomatoes.